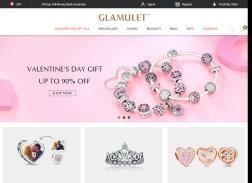 Glamulet designs, manufactures and markets hand-finished and modern jewelry made from genuine materials at affordable prices. Get 15% off your first order of Bracelet Charms over $159. Save 15% on fashion Jewelry, Free Shipping and Free Charm on order over $179. After Mother’s Day Sale! Get up to 85% Off your order. Signup & Get & 10% off your first order of Bracelet Charms. Save 20% on Fashion Jewelry + Free Shipping and Free Charm on $219+. Expires on 12/31/2015. Get 12% off your first order of Bracelet Charms over $109. Save 18% on fashion Jewelry $199 or more. Plus, Get Free Shipping and Free Charm on order over $199. Expires on 12/31/2015.